The Trump administration today moved to weaken another offshore drilling safety rule enacted after the BP Deepwater Horizon disaster, the worst environmental catastrophe in U.S. history. Today’s proposed changes to the safety rule known as the “Blowout Preventer Systems and Well Control Rule” were issued in response to President Trump’s order to reduce regulations on fossil fuel companies. The move comes just months after the administration released an unprecedented plan to vastly expand offshore oil and gas drilling into all U.S. oceans. The Deepwater Horizon disaster — which began on April 20, 2010 — killed 11 oil workers and spewed more than 210 million gallons of oil into the Gulf for nearly three months, killing thousands of marine mammals, sea turtles and birds. Federal investigators determined that a defective blowout preventer was one of the causes. Following Deepwater Horizon the Obama administration enacted a set of offshore-drilling safety rules, in consultation with the oil industry, and established the Bureau of Safety and Environmental Enforcement to regulate offshore drilling. Bureau Director Scott Angelle, a Louisiana politician with deep ties to the oil industry, in December proposed to weaken another rule regarding production safety systems. Today’s target, the well-control rule, focused on the standard for blowout preventers, devices used to monitor and seal oil and gas wells when operations go awry. 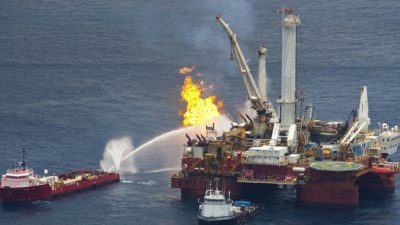 The proposed changes would delete or amend several provisions of the rule, including eliminating the requirement that the Bureau certify the third parties that inspect offshore safety equipment and allowing industry more flexibility in their use of real-time monitoring of deepwater drilling operations. The Bureau announced the proposed changes on a call today and said it will send the proposed changes to the Federal Register today, to be published early next week. The Bureau will accept public comment on the proposed changes for 60 days.